It has become quite common of late to see black and Arab characters in the foreground of many French movies. 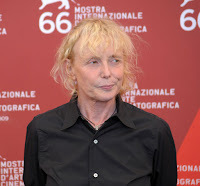 Sometimes they have bit parts but often, as some of the films screened at Toronto’s Cinéfranco film festival demonstrated, they are the main characters. It’s a late recognition of the country’s multicultural mosaic, prompted, I suspect, by the realities of what’s actually happening on the streets of France, but also because of the increasing presence of actors and directors from those communities working in French cinema. 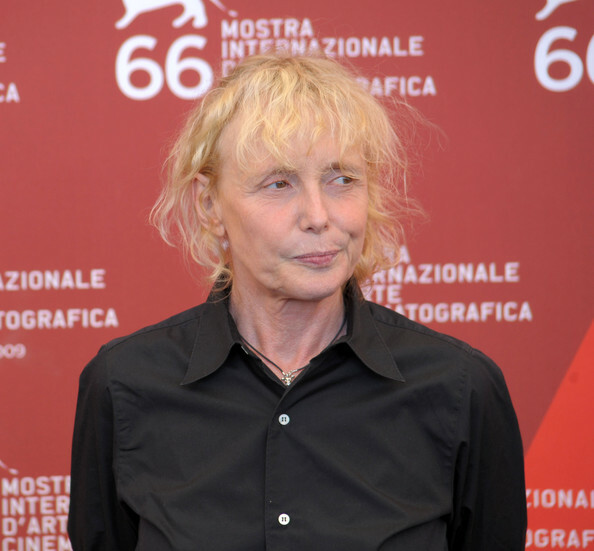 But there was one French filmmaker, Claire Denis, who has always populated her films with members of these groups, beginning with her widely seen and hailed feature film debut, Chocolat (1988). That movie, loosely based on her childhood growing up in various African countries as the daughter of a French civil servant, touchingly focused on the relationship between a young girl named France (Cécile Ducasse) and the family ‘houseboy’ Protée (Isaach de Bankolé, who also pops up as an enigmatic figure, a rebel leader called The Boxer, in White Material) and brought forth a nuanced view of the colonial relationship between France and its African ‘possessions.’ Many of her other films, which were set both in France and other countries, including S’en fout la mort (No Fear, No Die, 1990), J’ai pas sommeil (I Can’t Sleep, 1994), Beau travail (Good Work, 1999) and 35 rhums (35 Shots of Rum, 2008) prominently featured blacks and Arabs, sometimes with their race or religion being a significant factor in the story, and just as often not emphasized at all and merely presented as a depiction of fact. The quietly powerful White Material (2009), her latest and tenth feature, based on a Doris Lessing novel and which Criterion has recently released on DVD in a pristine new digital transfer approved by the filmmaker herself, is one of the former, where race (and race hatred) is part and parcel of the tale. While White Material is also set in Africa, though a few decades later than the 1930s period of Chocolat, it's not in any way a sequel to that movie, it's more a re-visit to the continent. The movie also functions as a bookend to Denis’ oeuvre, not least because it, too, was filmed in Cameroon, the location of her debut. Chocolat was largely seen through the eyes of a white child, slowly learning about the adult complexities of life, but retaining fond memories of the African men and women she encountered growing up. 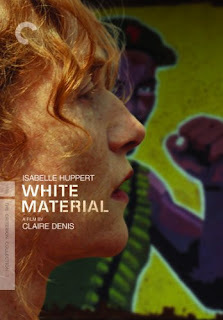 By contrast, White Material’s central white character, coffee plantation owner Maria Vail (Isabelle Huppert), functions mostly as the locus of black resentment and loathing. In an unnamed French speaking African country (but supposed to be the Ivory Coast, where political turmoil prevented the film from shooting there), presumably in the 1960s, revolution is in the air. Rebels are fighting the government, with ordinary folk caught in the middle. The country’s white population, many of whom, such as Maria, who have resided there for years, are being targeted specifically by both sides, reminiscent of Robert Mugabe's recent attacks on white farmers on Zimbabwe. As an anonymous radio announcer, echoing the horrific calls for genocide in 1994 Rwanda, ominously proclaims that the days of the country’s ‘privileged’ classes, derogatorily referred to as white material, are numbered, the owners of the plantation, Maria, her ex-husband André (Christopher Lambert), his father (Michel Subor) and their son Manual (Nicolas Duvauchelle), try to figure out what’s what amidst the escalating chaos around them. Their frightened employees begin to desert them, though the coffee crop needs to be harvested in five days, and Maria’s attempts to hire on replacements are fraught with tension and complications. Eventually, events come to a deadly head. Beginning in the ‘present’ as Maria is suddenly thrust into the heart of the vortex of the violence surrounding her and flashing back a few days, to the beginning of her own troubles, and then back and forth between the two time frames, Denis expertly weaves a compelling web of suspense and disorientation. 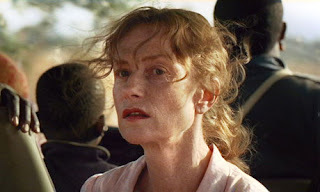 Maria, superbly played by Huppert, is alternately steely and fragile, much like the environment itself, with the Africans displaying strength and weakness in equal measure. (It’s what we’re not explicitly told about Maria, the reason why her marriage broke up, why she won’t admit the truth about her son's mental instability, that Huppert manages to convey in a gesture or movement or even a look. It’s some of her best acting in a career chock-full of great performances. In fact, Huppert is so at home in Denis’ world that it comes as something of a surprise when one finds out that this is the first time they’ve ever worked together.) But Denis never succumbs to polemics – she’s incapable of that – and doesn’t, for one second, cast Vail and the other whites as villains, though references to their paternalistic attitudes are likely true, as well. She also doesn’t shy away from portraying the thuggishness of many of the soldiers and rebels, who number among them some child soldiers, but also, significantly, allows one rebel to express contempt at how Vail and her compatriots, by willingly paying bribes to get from one destination to another, have corrupted the country. (She’s always shown guts in her varied, non-politically correct depiction of minorities, profiling a loving father and his daughter in a movie like 35 rhums but also depicting a gay black drag queen and (real life) serial killer in J’ai pas sommeil.) And since the rebels don’t seem to be democratically or morally preferable to the rulers, we’re as buffeted and confused by events as Maria and her family are. Oddly enough, since the one dud in Denis’ resume was the Cronenberg-like vampire tale Trouble Every Day (2001), White Material comes across in so many ways like a (great) horror movie, with the genre’s familiar tropes – the cut off phone, the isolated location, the menace outside, the besieged inhabitants breaking ranks – being moodily ramped up to terrific effect, aided by her usual musical collaborators, the English rock band Tindersticks. It could also be a seen as a ghost story since Maria and her family are in effect, spirits, about to be banished from the living realm of their country and, more crucially, people whose time has passed as the plantation is financially going under anyway. What will remain of them, besides memories, after they’ve gone? 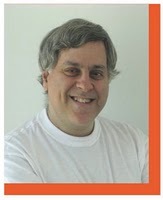 (Ghosts, of course, are also commonly perceived as being white.) The film, typically for Denis, looks ravishing, though this time Yves Cape (Ma vie en rose) photographed the movie, instead of Denis’ usual cinematographer Agnes Godard, who was unavailable. There are a couple of minor problems with White Material. Though all the other actors are fine, Duvauchelle’s performance as the unstable Manual, who loses it and shaves his head after being humiliated by a couple of young soldiers, is overdone. He, unfortunately, imparts an air of theatrical artificiality to an otherwise scrupulously realistic movie. He might have been more at home in Bertrand Tavernier’s masterful African-set 1981 black comedy Coup de Torchon. And while Denis gets to showcase her penchant for lovely and subtle dialogue-free sequences – in another life, she’d have been a remarkable silent film director – they’re by necessity anchored to a more traditional, and (for her) comparatively conventional narrative. Yet, if the film falls somewhat short of Denis’ masterpieces – J’ai pas sommeil, Vendredi soir (Friday Night, 2002), the original cut of L’intrus (The Intruder, 2004) and 35 rhums, White Material is still a gripping, provocative experience. ** The decent extras on the disc include illuminating interviews with Denis, Huppert and Isaach de Bankolé, Denis’ fascinating short documentary on White Material’s 2010 reception at Cameroon’s Écrans Noirs Film Festival, a deleted scene (which was better left out of the film) and the movie’s trailer.